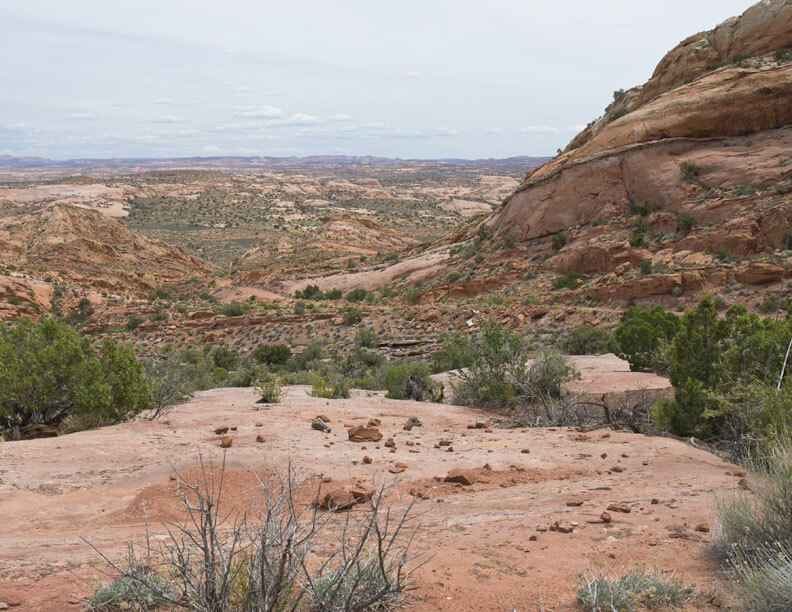 June 8th, we left our motel room in Blanding (after breakfast at the Old Tymer restaurant) and drove west to the Natural Bridges National Monument area. 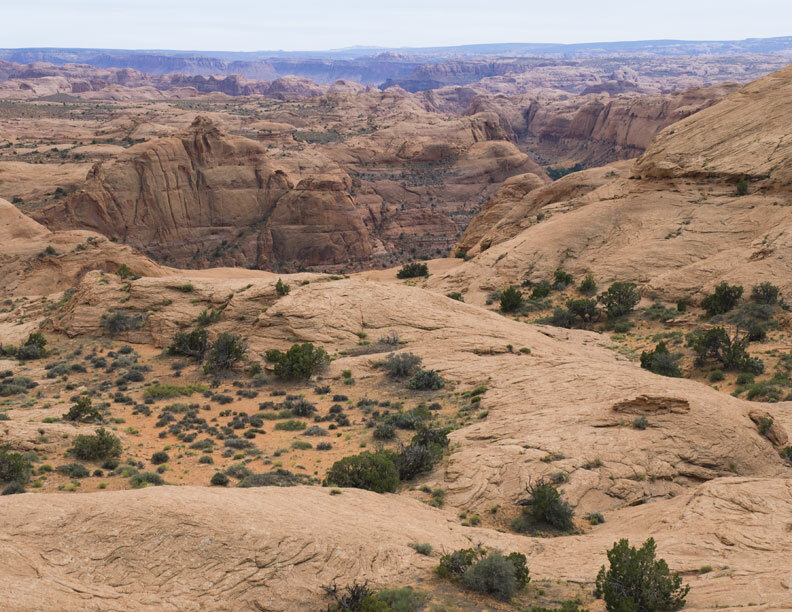 We then turned south and then west towards Hall’s Crossing on Lake Powell. Just after passing through Castle Creek, we parked just off the road and headed west down the Hole-in-the-Rock trail on the ATVs. 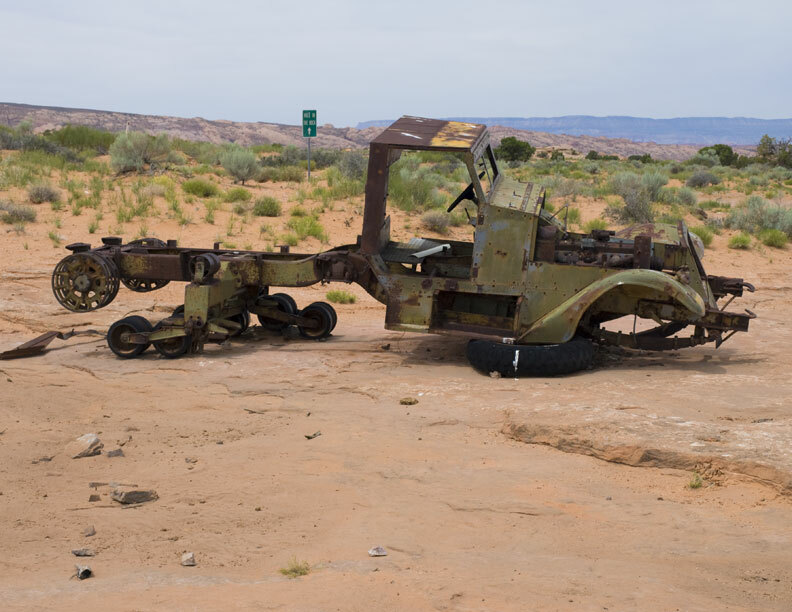 Down the road a ways, there is an old half-track relic abandoned in a wash. The skies were most overcast with the sun poking through now and then. The chance of rain was only slight and the clouds kept the temperatures from getting hot. Weather wise, it was a perfect day to be in that area. Several years ago, David and I had driven this road and ended up in Lake Canyon were the road got too rough for my Explorer. 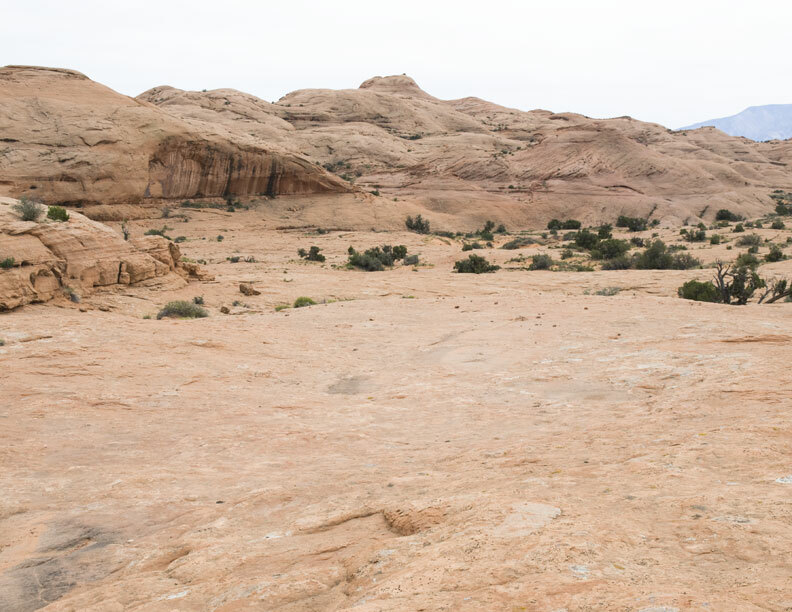 This time we figured that the ATVs would get us further down the trail and hopefully, close enough to be able to hike to Old Settlers Arch. However, instead of ending up on the Lake Canyon trail which joins the Hole-in-the-rock pioneer trail, we ended up taking the Hole-in-the-Rock trail on the southeast side of Lake Canyon. 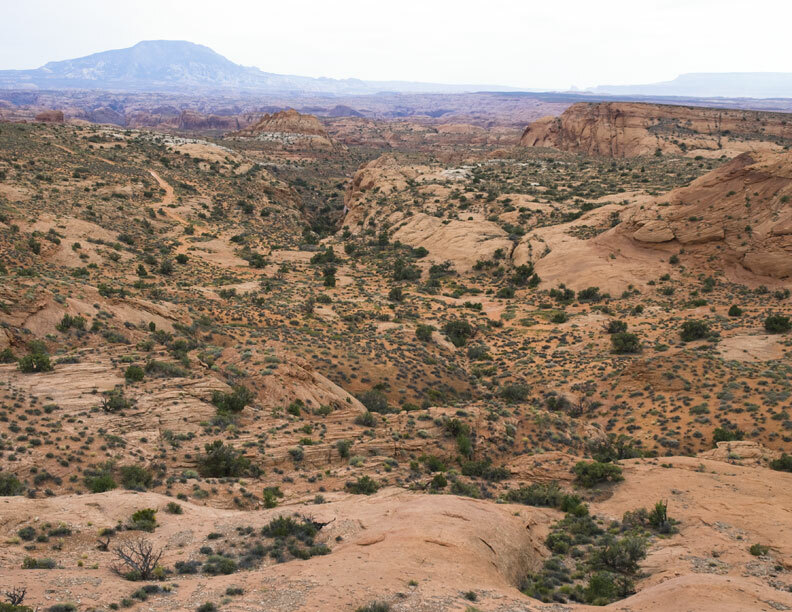 This trail was the original path that the Hole-in-the-Rock Mormon pioneers took from Escalante, across the Colorado River Gorge, through the rugged sandstone hills and canyons before making it to present day Bluff Utah. 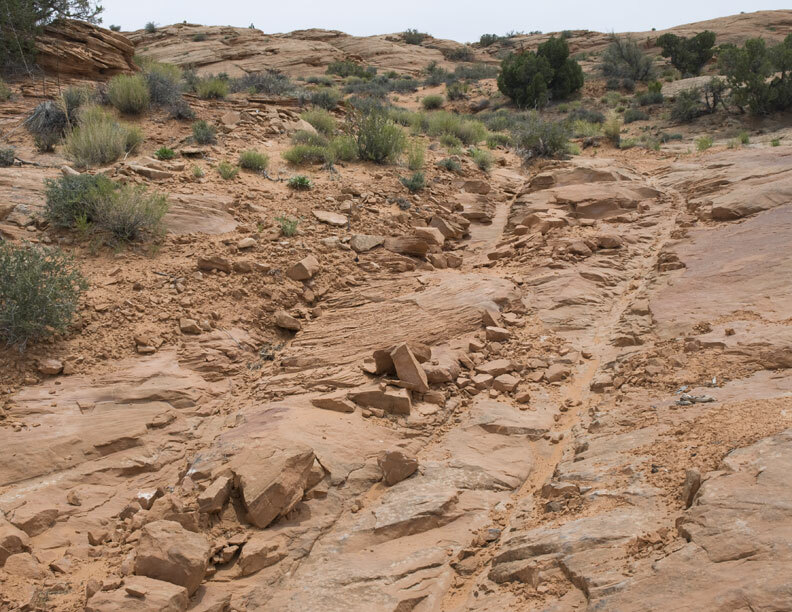 Several times along the trail, you could see where the wagon wheels had cut into the sandstone. 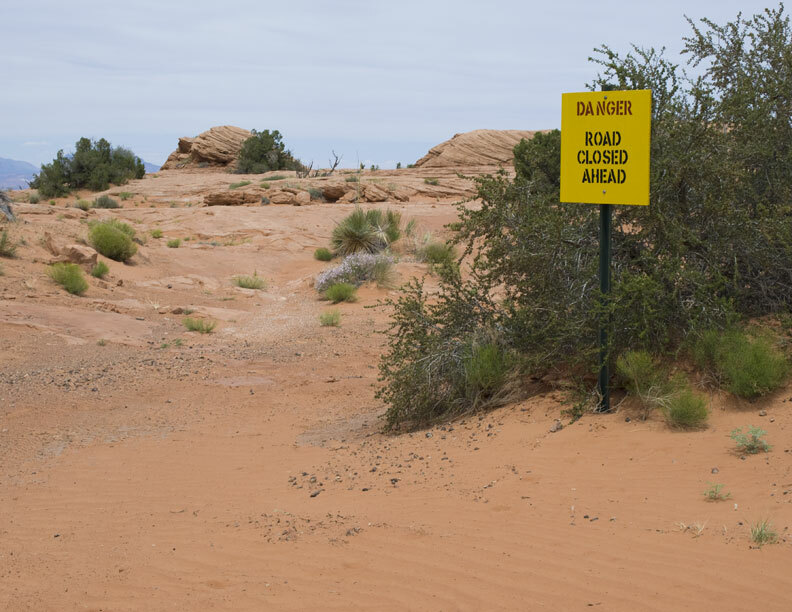 This “trail” turned out to be the roughest, trickiest, scariest trail we had yet taken with ATVs — and that includes the Devil’s Racetrack trail! I have no idea how the pioneers managed to take wagons and horses/oxen/mules/stock through this area. It was unbelievable! There was one drop off a sandstone hill that required an extra person hanging on the side to keep from rolling the ATV. We REALLY did not enjoy that trail! When the Lake Canyon trail joined the Hole-in-the-Rock trail, we were surprised to find a “DANGER – Road Closed” sign indicating that the Lake Canyon trail was no longer open. We really wanted to go back via that road so that we didn’t have to go back over the worst of the Hole-in-the-Rock trail. Less than a mile later, the trail became so bad that we could not continue. We could see where “Rock Crawlers” or modified jeeps had scaled the drop off and struggled to get back up the trail but we didn’t even try it. It was the end of the trail for the ATVs. On the way back to the ATVs, David and I got separated which caused some delays getting back to the ATVs. We decided that we really need to carry two-way radios in our packs for these situations. On the way back on the ATVs, we really wanted to at least try the Lake Canyon trail but it probably would have wasted a couple of hours and we would have had to go back over the Hole-in-the-Rock trail anyway. As it turned out, we were able to navigate our way back without much difficulty. By the time we got to the top of the worst part, I was a little ill from a long day bouncing around on ATVs. We certainly have a new respect for the efforts of those Mormon pioneers that took wagons through this area. They are mostly remembered for crossing the Colorado River and Gorge by blasting a hole in the cliffs large enough to lower wagons and stock through. 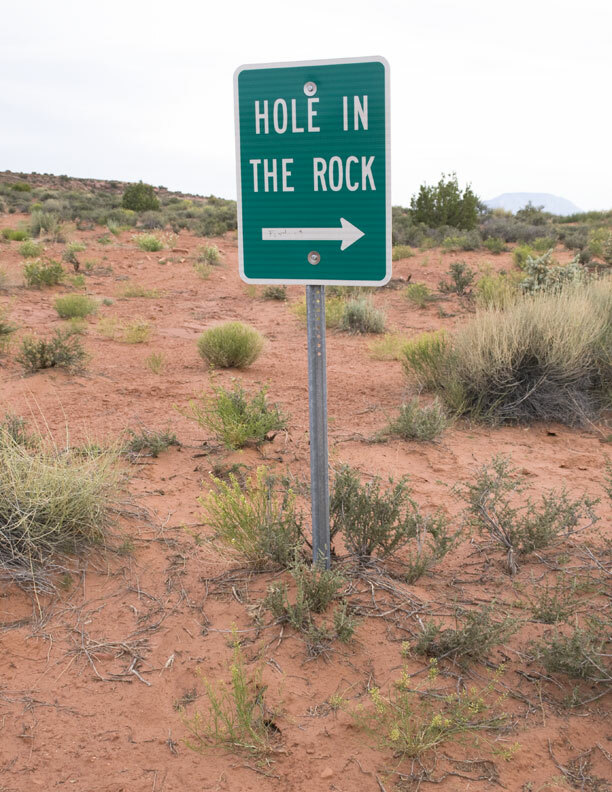 What we didn’t know is that the Hole-in-the-Rock was only a small part of their ordeal. 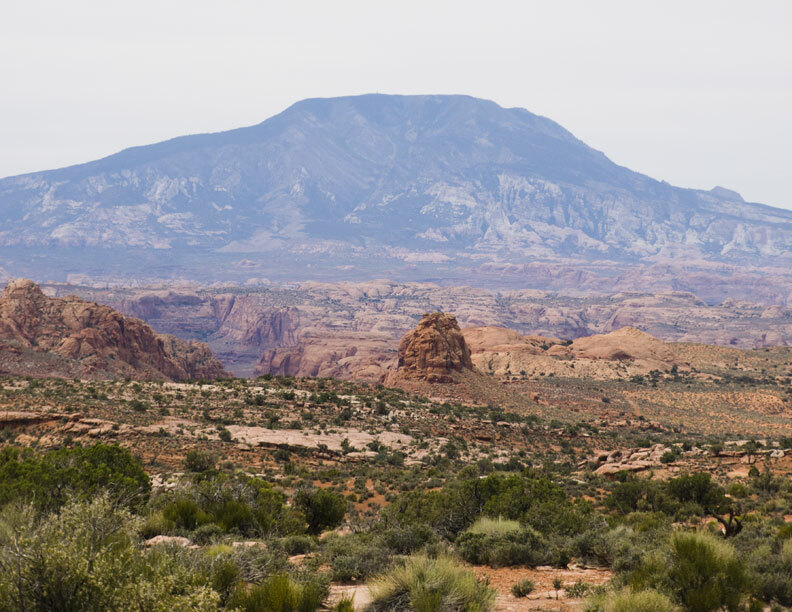 No wonder they were unable to go any further when they got to the area now called Bluff Utah. It is amazing that they were able to even get that far. On the way out, we were finally on fairly decent trail again when we did find one side road that we explored. 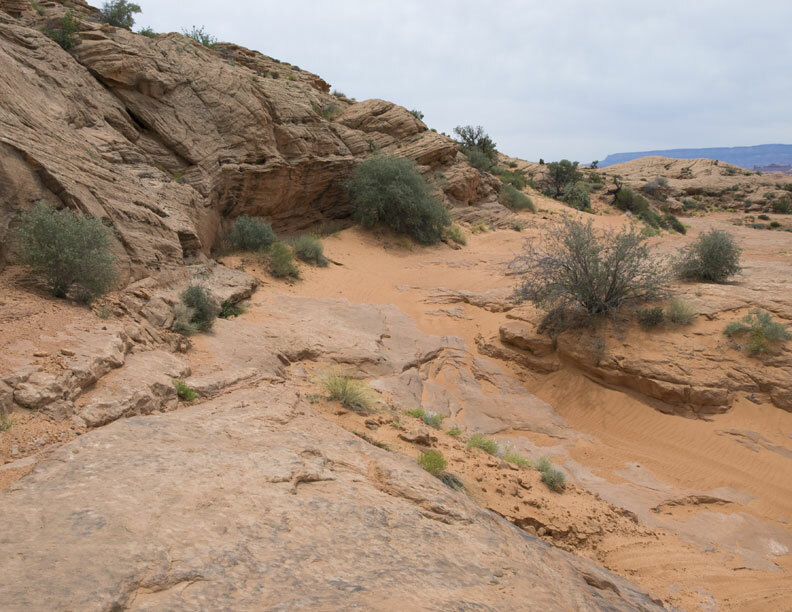 It didn’t go far but from a ridge, it did give us a fair view into Slick Rock Canyon on Lake Powell. When we finally got back to the main gravel road, I let David get a head start so I wouldn’t have to eat his dust on the way back. Then, as I was making a slight turn in the road several miles later, there was a bang which sounded like my rear left tire blew out. However, when I got off to look at it, it was still inflated. I then found about four inches of a large five inch rusty nail sticking out of the tire. As the wheel turned, the nail was whacking the mud guard and ripping it up. Now I had a problem. I had the tire patch kit in my ATV but David had the electric air pump in his ATV. So it became important to not loose any air while I plugged the hole. Somehow I managed to get the nail out, prepare the hole and plug it with only one hand while I used fingers of the other hand to keep the air from spewing out. It took two tries but I managed to get the hole plugged and still have the tire mostly inflated. That got me back to the Explorer and trailer without problems. Total miles on the ATV’s that day = 39.7 miles. We then drove back into Blanding to get another motel room for another night.